Download "COLOR AND YOUR HOME. Anyone who drives a car in a city follows traffic rules defined by red, green and yellow; no descriptive text is necessary." 1 COLOR AND YOUR HOME DEFINITION OF COLOR: Paraphrased Merriam Webster defines color as: A phenomenon of light or a visual perception that enables one to differentiate otherwise identical objects and/or a color as contrasted with black, white, or gray. That s a little bit vague. On a micro level, color is electromagnetic light-waves that bounce off of the molecules that make up a particular object or surface. These light waves are reflected and absorbed making parts of the light spectrum visible to the human eye. That part is the color or hue. In other words, an object's color is determined by which wavelengths of light it reflects. Color is such an integral part of our lives. Nature uses color to warn off potential predators, to attract pollinators, to attract mates and to show fruit is ready for eating. Anyone who drives a car in a city follows traffic rules defined by red, green and yellow; no descriptive text is necessary. In advertising and design, color is used to grab attention and stimulate interest in ways that would be difficult to create by any other means. Throughout history color has been used to indicate status, for example nobility and royalty is associated with purple. Color is an important source of symbolism in many cultures. The Iowa Nation of American Indians considers four colors to be sacred: Black, yellow, red and white. They represent direction, their flag, and what they consider to be four races of man. The ultimate goal here is to help you feel more comfortable selecting colors for your home. The best way to start is by looking at colors you know you love. >>>Think to yourself, what is my favorite color? 5 Red is the warmest and blue is the coolest color. Warm tones appear in the red, orange and yellow side of the spectrum, with the cool tones appearing on the opposite side of the color wheel. Colors can complement one another, or can create chaos. Color can be used to warm a cool room or cool a warm room. They can make a large room feel smaller and a small room feel larger. What I want you to know is that almost any color combination from the wheel will work together. So how do you go about choosing the right colors for your design? There is no single hard and fast rule, but your favorite color on the color wheel is a good place to get started. COLOR TRENDS Color trends are another. Do you ever wonder how color trends occur? The COLOR MARKETING GROUP is an association for color design professionals from around the world. They get together once a year to discuss and basically forecast what colors will be popular the following year in terms of décor, fashion, print, even makeup. Learn more at: Paint manufacturers produce and promote their own versions of color trends as well. 6 Pantone is perhaps a familiar name. It started as a printing company, but works in paints and other color products now. Pantone is famous for its color matching system and the standardization of color. Like the Color Marketing Group, they also pick colors for the year. See their picks for 2013 above and find out more at: PALETTE As I mentioned colors don t have to match. Consider the color wheel and colors in nature. What we are ultimately looking for in our color schemes is harmony. There are many theories for harmony, but the following illustrations and descriptions will give you some basic formulas: 1. Analogous colors Analogous colors are any three colors which are side by side on a 12 part color wheel, such as yellow-green, yellow, and yellow-orange. Usually one of the three colors predominates. ANALOGOUS COLOR SCHEME 2. Complementary colors Complementary colors are any two colors which are directly opposite each other, such as red and green and red-purple and yellow-green. 10 EMOTION AND COLOR The next question to ask yourself is WHY I like color X? Think about what a certain color brings to mind for you..? Vicky Early of Current in Carmel Magazine says, It is impossible to separate emotion from color. She talks about pink in an airy shade. It takes you to a time of little girl innocence - if you have a daughter, what color did you first use to decorate her room? Paired with green, we think of blooming flowers. Put it with black and retro 50s décor comes to mind. Some of the emotions specific colors tend to bring on: yellow = cheer, energy green = fresh, growth pink = soft soothing red = passion, drama orange = appetite and conversation purple = mystery, interest blue = sky, ocean, tranquil, clean Put the blue with red = patriotic That red with green = Christmas/holiday DESIGNER TIPS AND TRICKS TIPS: Ask yourself, What s my favorite color? Start with a color you love. Even if it s not a trend at the moment, it will always be on trend in a space that resonates with you. Choose the best paint you can afford. Good paint has better pigments and a more livable finish. Flow two or three of the same colors throughout your home. An accent wall in the family room is reflected in the master bedroom bedding. Using a particular color throughout your home to unifies the spaces Save strong wall colors for statement rooms that are smaller and visited less a library, powder room or guest room. 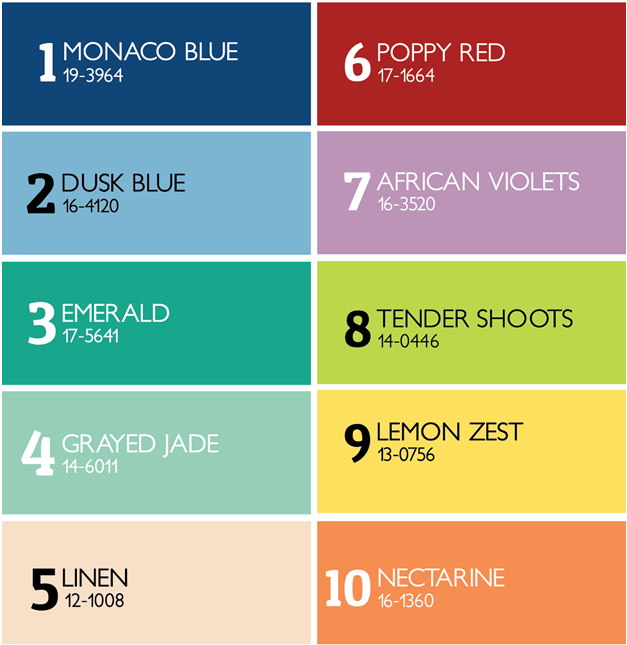 11 Choose colors based on the use of a room. Morning rooms can be brighter; rooms used at night can go dark. Play with intensity. Create a monochromatic room that uses a single hue in a variety of ways. When rooms open to one another, avoid choosing radically different colors. This chops up and has a tendency to shrink spaces. Create vistas of harmonizing color visible from room to room. Blend in strong colors. A bold color on the wall will feel jarring unless you consider the trim and ceiling color in your plan. If you find a color you love but you re afraid it might be too dark, ask the person mixing the paint to do a 50% tint of the color. Give yourself permission to use a bold color. You don t have to love it everywhere one throw pillow might be just enough. In the same way a bright shoe adds surprise and fun to a black outfit, an unexpected touch of trim along a certain panel or in piping can add color that is easy to live with. What s more livable than the colors found right outside your back door? Look to earthy, natural colors blues, greens, beige and taupe. It is important to note that light affects visual color significantly and inextricably! Paint a large board and move it around the room. Look at it in the morning and at night and view it near your furniture. Colors close together on the color wheel are analogous and will make a calm room. Colors that are farther apart are complementary and add drama. Think of places and spaces you love for inspiration - for example, cream stucco walls in Italian churches. Try to match that feeling. Your home is made up of more than walls ceilings, floors, stairs and doors are also great places to have fun with paint and color. When choosing wall colors, find versions of your favorite colors that are muted with gray. 12 When you shop for paint, take along an existing pillow, a piece of drapery fabric or a photo of your space to make informed color decisions. Warm colors like red, yellow, and orange have an energizing effect. These colors also tend to advance or pop. Blue, green, and gray are calming and tend to recede. You can take just about anything to a paint store and ask the associate to mix a paint that s a perfect match using the store s color reader. Layer bold color with midtones and neutrals to balance color in a room. There is such a thing as too many colors. This creates chaos. If your eye has nowhere to rest, you have too many colors and you need to edit. TRICKS: Always sample paint colors. Paint a large sample board so you can move it around a room. Is painting an entire room overwhelming? Paint an accent wall, stencil or color block. Color blocking is where you only paint sections of walls or defined areas as the bumpout over a fire place. Add interest with a textured paint roller. 13 Paint retailers like Benjamin Moore and Sherwin Williams, have systems on their websites for color selection. They also provide design ideas. Staff members are trained to help and some have decorators you can contact for further assistance. You can also find websites to upload images and virtually try out colors before committing. Valspar has a simple virtual color selector. Cover doorknobs with tinfoil to mask the surrounding area. Wrap a rubber band around paint cans to remove excess paint and prevent from filling the rim. Wouldn t it be nice to have a crystal ball that would let us predict the healed result of any pigment we choose? Think of it. No more worries about blue lips,purple (or pink) brows, or concerns about undertones. Color Wise. A sophisticated pastel palette gives this 1830s home a refreshing new look.